Traveling to new countries means that it takes longer to connect to friends and family we leave behind. Having access to free and safe airport WiFi can be so helpful in such situations. WiFox is a paid app for iOS and Android that helps users access airport WiFi passwords and network names (of course) so you can surf the Internet not just easily but also safely. The app has Wi-Fi information for over 70+ airports and all its data is crowdsourced. That means it is continuously updated by air travelers. All passwords are verified and added to the map. You can updated it in real-time on your phone when you have an Internet connection. You can up-vote a network link or down-vote it if any of the passwords fail or don’t work. To access the Wi-Fi connection, you need to head over to the map view and tap a Wi-Fi icon. A button the screen lets you copy the password to the clipboard. You can then paste the password in the respective Wi-Fi settings screen to access the Internet. 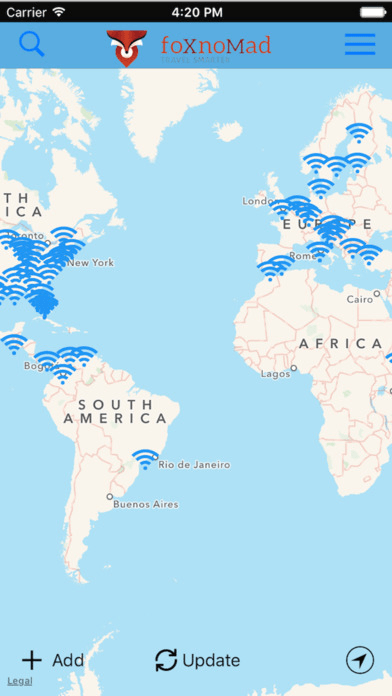 The Wi-Fi map in WiFox map is also available offline so you don’t need an Internet connection to use the app when you are traveling. 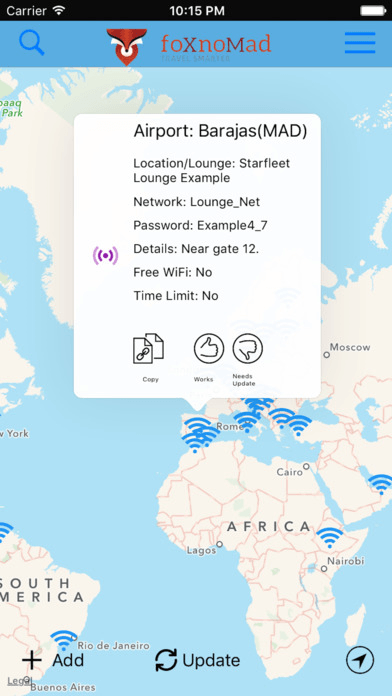 The app also supports network names and passwords from airport lounges so if you happen to be in one, you can simply take advantage of WiFox’s offerings. The app also displays timed networks, with some helpful tips on how to get around the time restrictions, if you need to. WiFox also promises to protects users using the free, open Wi-Fi networks by providing the correct network name. This is to ensure that users don’t unwittingly connect to a rogue or malicious one. Copy Passwords Easily– The app allows you to copy WiFi passwords directly from the app and paste them into the phone settings. Get Around Time Restrictions – If there are networks with time limits, the app indicates the fact along with tips on how to get around it. Real-Time Updates– All users can rate the passwords, letting the developer know if it needs an update. Users can also send an updated password for verification directly through the app. Rating System – You can check the reliability of the passwords from the color coded WiFi icons. If you travel a lot and find yourself with constantly plagued with mobile data restrictions, this app offers a pretty decent and smart way to stay connected to the outside world. One cause for concern is that the app is crowdsourced so it may not always reflect the correct password unless it is frequently updated by users. If you wish to give the app a try, you’ll have to pick up your copy for $1.99. There’s no free version.